First Appearance: The Uncanny X-Men (vol. 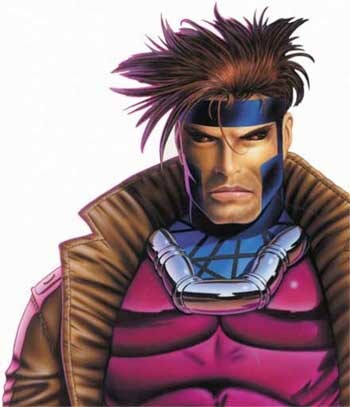 1) #266 (Late Aug. 1990): "Gambit: Out of the Frying Pan"
Gambit is overtly as a Catholic, although he is not always a Catholic who is orthodox in his practice. There is much overtly Catholic lore in Gambit stories. 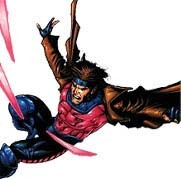 One excellent example of this is the second Gambit limited series, in which Gambit steals the Cross of Redemption from Miami mobsters and returns it to the Vatican. The Adventures of the X-Men #12 (Mar. 1997): "Better to Light a Small Candle..."
The All New Exiles Vs. X-Men #0 (Oct. 1995): "X-Over"
The Amazing X-Men #4 (June 1995): "On Concencrated Ground"
Avengers Academy #38 (Dec. 2012): "Crosstown Rivals"
Bishop #4 (Mar. 1995): "Final Reckonings"
Black Panther (vol. 4) #8 (Nov. 2005): "Wild Kingdom 2 of 4: House of Paine"
Contest of Champions II #4 (Nov. 1999): "Final Cut"
Contest of Champions II #5 (Nov. 1999): "Victory!" Daredevil (vol. 1) #330 (July 1994): "Disinfomocracy"
DC/Marvel All Access #2 (Early Jan. 1997): "Two Sides of the Same Coin"
Excalibur (vol. 1) #57 (Nov. 1992): "For Whom the Bell Trolls!" Excalibur (vol. 1) #58 (Dec. 1992): "Troll Call"
Maximum Security #3 (Jan. 2001): "Whatever the Cost!" New X-Men (vol. 2) #13 (July 2005): "Into the Light"
Rogue (vol. 1) #1 (Jan. 1995): "An Affair to Remember"
Rogue (vol. 1) #2 (Feb. 1995): "Choices"
Rogue (vol. 1) #3 (Mar. 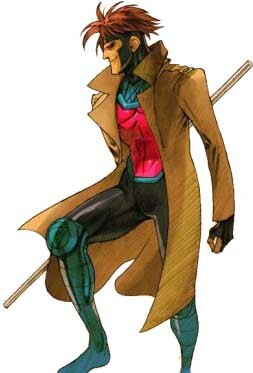 1995): "The Gauntlet"
Rogue (vol. 1) #4 (Apr. 1995): "Back to Life!" Rogue (vol. 3) #5 (Jan. 2005): "Going Rogue, Part 5"
The Uncanny X-Men (vol. 1) #266 (Late Aug. 1990): "Gambit: Out of the Frying Pan"
The Uncanny X-Men (vol. 1) #277 (June 1991): "Free Charley"
The Uncanny X-Men (vol. 1) #350 (Dec. 1997): "Trial & Errors"
The Uncanny X-Men (vol. 1) #372 (Sep. 1999): "Rude Awakenings"
The Uncanny X-Men (vol. 1) #377 (Feb. 2000): "The End of the World as We Know It"
The Uncanny X-Men (vol. 1) #383 (Aug. 2000): "Moscow Knights"
The Uncanny X-Men (vol. 1) #387 (Dec. 2000): "Cry Justice, Cry Vengeance!" The Uncanny X-Men (vol. 1) #388 (Dec. 2000): "The Past is but Prologue!" The Uncanny X-Men Annual '96 (Sep. 1996): "X-Men Timelines"
X-Factor (vol. 1) #60 (Nov. 1990): "Brotherhood"
X-Factor (vol. 1) #61 (Dec. 1990): "Betrayal"
X-Factor (vol. 1) #62 (Jan. 1991): "Capital Punishment"
X-Factor (vol. 1) #69 (Aug. 1991): "Clash Reunion"
X-Factor (vol. 1) #70 (Sep. 1991): "Day of Decision"
X-Factor (vol. 1) #84 (Nov. 1992): "Tough Love"
X-Factor (vol. 1) #85 (Dec. 1992): "Snikts and Bones"
X-Force Annual (vol. 1) #1 (May 1992): "Know Your Enemy"
X-Men (vol. 2) #1 (Oct. 1991): "Rubicon"
X-Men (vol. 2) #1 (Oct. 1991): "Wish You Were Here..."
X-Men (vol. 2) #1 (Oct. 1991): "And the Best Is Yet to Come"
X-Men (vol. 2) #2 (Nov. 1991): "Firestorm"
X-Men (vol. 2) #3 (Dec. 1991): "Fallout!" X-Men (vol. 2) #4 (Jan. 1992): "The Resurrection and the Flesh"
X-Men (vol. 2) #5 (Feb. 1992): "Blowback"
X-Men (vol. 2) #6 (Mar. 1992): "Farther Still"
X-Men (vol. 2) #7 (Apr. 1992): "Inside...Out!" X-Men (vol. 2) #8 (May 1992): "Tooth and Claw"
X-Men (vol. 2) #9 (June 1992): "The Not So Big Easy"
X-Men (vol. 2) #10 (July 1992): "Where Happy Little Bluebirds Fly..."
X-Men (vol. 2) #11 (Aug. 1992): "The X-Men vs. the X-Men! (Again)"
X-Men (vol. 2) #12 (Sep. 1992): "Broken Mirrors"
X-Men (vol. 2) #13 (Oct. 1992): "Hazardous Territory"
X-Men (vol. 2) #14 (Nov. 1992): "Fingers on the Trigger"
X-Men (vol. 2) #15 (Dec. 1992): "The Camel's Back"
X-Men (vol. 2) #17 (Feb. 1993): "Waiting for the Ripening"
X-Men (vol. 2) #19 (Apr. 1993): "Harvest of the Innocent"
X-Men (vol. 2) #20 (May 1993): "Digging in the Dirt"
X-Men (vol. 2) #21 (June 1993): "The Puzzle Box"
X-Men (vol. 2) #22 (July 1993): "The Mask Behind the Facade"
X-Men (vol. 2) #23 (Aug. 1993): "Leaning Towards Oneself"
X-Men (vol. 2) #24 (Sep. 1993): "Digging Deeper Between Hope and Sorrow"
X-Men (vol. 2) #25 (Oct. 1993): "Fatal Attractions: Dreams Fade"
X-Men (vol. 2) #27 (Dec. 1993): "A Song of Mourning, a Cry of Joy"
X-Men (vol. 2) #28 (Jan. 1994): "Devil in the House"
X-Men (vol. 2) #30 (Mar. 1994): "The Ties That Bind"
X-Men (vol. 2) #31 (Apr. 1994): "The Butterfly and the Hawk"
X-Men (vol. 2) #32 (May 1994): "The Leopards and the Cats"
X-Men (vol. 2) #33 (June 1994): "The Hearts of Thieves"
X-Men (vol. 2) #34 (July 1994): "Life and Consequences"
X-Men (vol. 2) #38 (Nov. 1994): "Smoke and Mirrors"
X-Men (vol. 2) #40 (Jan. 1995): "The Killing Time"
X-Men (vol. 2) #41 (Feb. 1995): "Dreams Die!" X-Men (vol. 2) #45 (Oct. 1995): "The Enemy of My Enemy..."
X-Men (vol. 2) #46 (Nov. 1995): "They're Baaack..."
X-Men (vol. 2) #47 (Dec. 1995): "Big Trouble in Little Italy!" X-Men (vol. 2) #48 (Jan. 1996): "Five Card Studs"
X-Men (vol. 2) #50 (Mar. 1996): "Full Court Press"
X-Men (vol. 2) #51 (Apr. 1996): "Deathbound Train"
X-Men (vol. 2) #52 (May 1996): "Collector's Item"
X-Men (vol. 2) #54 (July 1996): "Inquiring Minds"
X-Men (vol. 2) #55 (Aug. 1996): "Invasion"
X-Men (vol. 2) #58 (Nov. 1996): "Testament"
X-Men (vol. 2) #81 (Nov. 1998): "Jack of Hearts, Queen of Death!" X-Men (vol. 2) #82 (Dec. 1998): "The Hunt for Xavier, Part Two: The Hunt for Charley!" X-Men (vol. 2) #83 (Jan. 1999): "The Hunt for Xavier Part Four: Tomb of Ice"
X-Men (vol. 2) #84 (Early Feb. 1999): "The Hunt for Xavier The Conclusion: Dream's End!" X-Men (vol. 2) #85 (Mar. 1999): "A Tale of Two Mutants"
X-Men (vol. 2) #86 (Mar. 1999): "Thanks for the Memories"
X-Men (vol. 2) #87 (Apr. 1999): "No Surrender!" X-Men (vol. 2) #88 (May 1999): "A World Apart"
X-Men (vol. 2) #89 (June 1999): "Yesterday's News"
X-Men (vol. 2) #90 (July 1999): "Eve of Destruction"
X-Men (vol. 2) #91 (Aug. 1999): "Technical Difficulties"
X-Men (vol. 2) #92 (Sep. 1999): "Dream's End Part 2: Pressure Points"
X-Men (vol. 2) #95 (Dec. 1999): "Do Unto Others"
X-Men (vol. 2) #96 (Jan. 2000): "The Gathering"
X-Men (vol. 2) #97 (Feb. 2000): "The End of the World as We Know It: Part 2"
X-Men (vol. 2) #98 (Mar. 2000): "First and Last: Part 2"
X-Men (vol. 2) #175 (Nov. 2005): "Wild Kingdom: Part One"
X-Men (vol. 2) #200 (Aug. 2007): "Blinded By the Light, Part 1"
X-Men (vol. 2) #202 (Oct. 2007): "Blinded by the Light, Part 3"
X-Men (vol. 2) #203 (Nov. 2007): "Blinded by the Light, Part 4"
X-Men (vol. 2) #204 (Dec. 2007): "Blinded by the Light: Epilogue"
X-Men (vol. 2) #205 (Jan. 2008): "Messiah Complex: Chapter Five"
X-Men (vol. 2) #207 (Mar. 2008): "Messiah Complex: Chapter Thirteen"
X-Men (vol. 3) #6 (Feb. 2011): "Curse of the Mutants: Conclusion"
X-Men and Captain Universe #1 (Dec. 1994): "Sleeping Giants"
X-Men Forever (vol. 1) #1 (Jan. 2001): "The Destiny Pact"
X-Men Forever (vol. 2) #Alpha (July 2009): "Rubicon"
X-Men Forever (vol. 2) #Alpha (July 2009): "Wish You Were Here..."
X-Men Forever (vol. 2) #Alpha (July 2009): "Firestorm"
X-Men Forever (vol. 2) #Alpha (July 2009): "Fallout!" X-Men Forever (vol. 2) #Alpha (July 2009): "New Dawn, New Day!" X-Men Forever (vol. 2) #1 (Aug. 2009): "Love--and Loss!" X-Men Forever (vol. 2) #2 (Aug. 2009): "Comes the Father!" X-Men Forever (vol. 2) #3 (Sep. 2009): "The Cruelest Cut"
X-Men Forever (vol. 2) #4 (Sep. 2009): "Strike-Back!" X-Men Forever (vol. 2) #5 (Oct. 2009): "Bury My Heart!" X-Men Forever (vol. 2) #6 (Oct. 2009): "Play Day!" X-Men Forever (vol. 2) #7 (Nov. 2009): "Past Is Prologue"
X-Men: Age of Apocalypse One-Shot #1 (May 2005): "[pin-up 3]"
X-Men: Alpha #1 (Feb. 1995): "Beginnings..."
X-Men: Black Sun #4 (Nov. 2000): "Fourth Spell: Light the Fire!" X-Men: Legacy (vol. 1) #212 (July 2008): "Sins of the Father, Part 2"
X-Men: Legacy (vol. 1) #213 (Aug. 2008): "Sins of the Father: Part 3"
X-Men: Legacy (vol. 1) #214 (Sep. 2008): "Sins of the Father: Part 4"
X-Men: Legacy (vol. 1) #216 (Nov. 2008): "Walkthrough: Part 2"
X-Men: Legacy (vol. 1) #220 (Mar. 2009): "Salvage: Part One"
X-Men: Legacy (vol. 1) #221 (Apr. 2009): "Salvage: Part Two"
X-Men: Legacy (vol. 1) #222 (May 2009): "Salvage: Part Three"
X-Men: Legacy (vol. 1) #223 (June 2009): "Salvage: Part Four"
X-Men: Legacy (vol. 1) #224 (July 2009): "Salvage: Part Five"
X-Men: Legacy (vol. 1) #226 (Sep. 2009): "Suppressing Fire: Part 1 of 2"
X-Men: Legacy (vol. 1) #227 (Oct. 2009): "Suppressing Fire: Part 2 of 2"
X-Men: Legacy (vol. 1) #229 (Jan. 2010): "Devil at the Crossroads: Part 3 of 4"
X-Men: Millennial Visions 2001 (Jan. 2002): "X-Men: Reborn"
X-Men: Millennial Visions 2001 (Jan. 2002): "X-Men: The Retro Men"
X-Men: Millennial Visions 2001 (Jan. 2002): "Brother(hood)'s Keeper"
X-Treme X-Men #4 (Oct. 2001): "Dreamtime Serenade"
X-Treme X-Men #5 (Nov. 2001): "Deadline!" X-Treme X-Men #6 (Dec. 2001): "Paradise Lost!" X-Treme X-Men #7 (Jan. 2002): "Getting Even!" X-Treme X-Men #8 (Feb. 2002): "Boomerang!" X-Treme X-Men #9 (Mar. 2002): "Face the Music!" X-Treme X-Men #10 (Apr. 2002): "Keys of the Kingdom"
X-Treme X-Men #11 (May 2002): "Beachhead!" X-Treme X-Men #12 (June 2002): "Second Front!" X-Treme X-Men #13 (July 2002): "Strikeback!" X-Treme X-Men #14 (Aug. 2002): "All or Nothing!" X-Treme X-Men #15 (Sep. 2002): "Final Gambit!" X-Treme X-Men #16 (Sep. 2002): "While I Live, You Don't Die!" X-Treme X-Men #17 (Oct. 2002): "Rogue's Destiny: La Suerte De Matar!" X-Treme X-Men #18 (Nov. 2002): "Day of the Dead"
X-Treme X-Men #19 (Dec. 2002): "Passages"
X-Treme X-Men #31 (Nov. 2003): "This is the Way the World Ends"
X-Treme X-Men #32 (Dec. 2003): "Intifada Part 2 of 5: W.M.D. (Weapons of Mass Destruction)"
X-Treme X-Men #33 (Dec. 2003): "Manifest Destiny"
X-Treme X-Men #34 (Jan. 2004): "Crossed Swords"
X-Treme X-Men #35 (Jan. 2004): "Intifada Part 5: Detante"
X-Treme X-Men #36 (Feb. 2004): "Storm: The Arena Part One: Challenger"
X-Treme X-Men #40 (Mar. 2004): "Prisoner of Fire Part 1: Ambush"
X-Treme X-Men #41 (Apr. 2004): "Prisoner of Love Part 2: Past Lies"
X-Treme X-Men #42 (Apr. 2004): "Prisoner of Fire Part 3: Eyes of Fire"
X-Treme X-Men #43 (May 2004): "Shadows of the Soul"
X-Treme X-Men #44 (May 2004): "Prisoner of Fire Part 5: Liberation"
X-Treme X-Men #45 (June 2004): "Prisoner of Fire Conclusion: Hunting Bogan!" X-Treme X-Men #46 (June 2004): "One For My Lady... ...One More for the Road"
X-Treme X-Men Annual 2001 (2001): "Queen of Shadows"
X-Treme X-Men: X-Pose #2 (Feb. 2003): "Watershed"